The term "Grinder" can be traced back to the East Coast, where, during WWII Italian immigrants setup sandwich shops close to the shipyards. Their freshly baked Italian rolls were filled with generous amounts of meats and cheeses and were then baked and garnished with lettuce and tomato. These super-sized sandwiches were a favorite of the hard working men who ground rivets off the warships. The friendly shop owners referred to the men as grinders and the ever popular sandwiches also came to be known as Grinders. Since 1998, Bellacino’s, Inc. has been showing franchisees how to successfully operate pizza & grinder shops. Family recipes for our unique foods, only the best foods from our approved distributors, ergonomic kitchen design, and proven operational guidelines are all reasons for our successful development into 14 states. “Made from scratch” (in your store) Italian bread and pizza dough are the foundations of our great tasting and unique flavor profiles of our menu items. Huge portions and a commitment to using only the best and freshest food products are keys to giving your customers a great product at a great value. All our recipes were established by Samual Mancino Sr. in the 1950's near <?xml:namespace prefix = st1 ns = "urn:schemas-microsoft-com:office:smarttags" />St. Clair Shores, Michigan. The original concept is still prevalent in all the Bellacino's shops today. The original recipes and good customer relations have never changed. Bellacino’s “In-House” Marketing Director generates professional marketing material that is made available for your use within your marketing plan both locally and regionally. Radio, print media, direct mail, video, and in-store point-of-sale material is produced and provided in media kits for each and every franchised unit. Every one of Bellacino’s, Inc.’s officers has spent years of “hands on” time operating pizza & grinder style restaurants. This experience results in first hand working knowledge of our in-store operations. This “system” is reviewed regularly by our corporate personnel and monitored by a sequence of reports from vendors and your POS sales data. 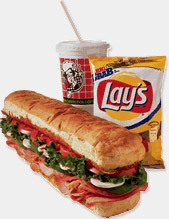 Bellacino’s new website includes a franchisee log-in site for “real-time” information sharing. 100% of our stores are franchisee owned. All of our future successes depend on our system of franchisees and the monitoring and maintaining of our system by our corporate office. To learn more about the Bellacino's Pizza & Grinders franchise opportunity, simply complete the form below.